One Item Three Ways - Club Monaco Susanna Skirt | La Petite Noob | A Toronto-Based Fashion and Lifestyle Blog. 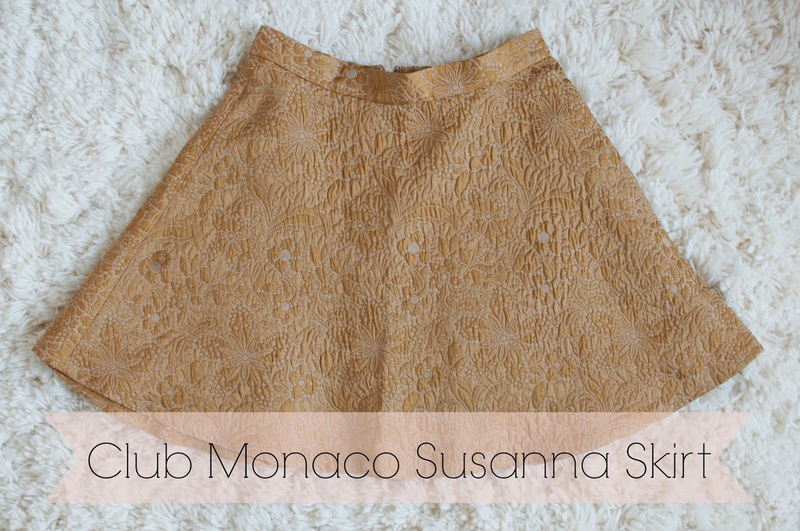 This Susanna Skirt from Club Monaco was the base piece for all three looks. I absolutely love these skirts - the flared fit makes them incredibly flattering and the embossing in this particular model makes it a perfect piece to build an outfit around - something unique that will stand out. The first look use of this skirt is to layer it up for winter. I chose a heavy opaque tight to save from any tush freezing, one of my favourite black sweaters, a thick knit scarf and a well-loved black beanie. Keeping the sweater over the skirt, instead of tucked in, gives a nice pop of colour to an otherwise monochromatic winter look. The second look is an easy transition into fall or spring. I ditched the heavy tights and added a leopard print belt. Instead of a heavy sweater, I opted for a light chambray shirt and rolled the sleeves. Topped with a statement necklace, and this skirt will quickly become a spring staple. Ah summer, please come soon! Dressing in the summer time is so easy - I just tucked a lightweight tank into the skirt, added a long necklace and my favourite sunnies - simple. With just a little extra thought, each and every piece in your closet can easily transition from one season to the next. What tips do you have in building a remix able wardrobe? *DISCLAIMER - Normally I like to take my outfit photos outdoors, but since the weather outside can rival that of the North Pole - indoors it is. Also, I'm still getting used to using a camera remote (which you can plainly see in the bottom left corner of each photo.) Such a Noob. That skirt is such a great texture and I love how you styled it by season, shows me exactly how versatile it really is!! Two things I need to obsess about, your hair and your makeup! You're seriously gorgeous girl!! Thank you Nidhi, you're so sweet! Yes this skirt is so incredibly versatile, which is exactly how I justified its purchase - and most of my shopping addiction haha!